Suffering and problems come to all of us at one time or another. Some of these are common to the human condition, but some come from doing good and some from doing evil. Children are punished for doing wrong, (at least they used to be), and people are fired, ostracized and jailed as the case may be, for various offenses. But there is a suffering that comes from being true to God’s Word, for being a witness to the truth, and for refusing to go along with the crowd. 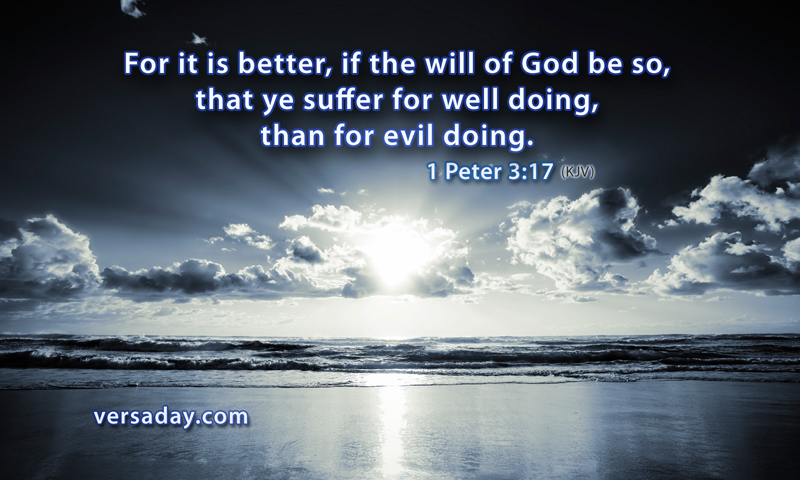 In either event, Peter says that it is better to suffer for well doing than for evil doing. Then there are the various ills that all flesh is heir to. Under these common sufferings, the unsaved are vexed and tormented even more by rebelling and saying, “Why me?” They also have the pangs of a guilty conscience, and if it is a serious illness, the fear and torment of death and the afterlife. If a Christian is submitted to God’s will, his sufferings are sweetened with the knowledge that God sees all, that His will is being done, and that “All things work together for good to them that love God, to them who are the called according to His purpose.” Romans 8:28.